In February of 2009 after much speculation, Faith No More had announced that a reunion tour would be in the works with John Hudson, the guitar player who was with them during the Album Of The Year era. Their first gig was a performance at the Brixton O2 Academy in London. True Faith No More fans have seen the Brixton show from the early 90’s on video. If you haven’t seen it yet, you should. The DVD is called You Fat B**tards and features the band at their peak in 1990 with former guitarist Jim Martin. All the initial tour dates that had been announced were overseas and even Mike Patton himself said that a United States leg of their tour would be highly unlikely. 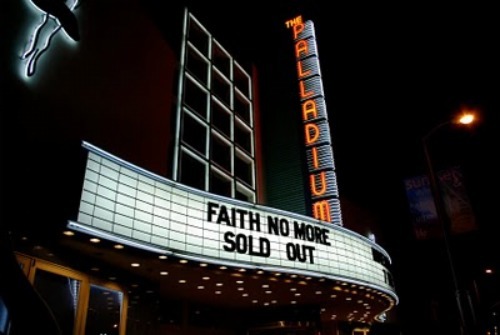 Patton lied to us because after touring in Europe, Israel, Australia, New Zealand and South America, Faith No More finally came home. The United States shows started in April of 2010 and included the Coachella Festival in Indio, two performances in front of the Brooklyn Bridge and three nights in San Francisco at the Warfield. “The Second Coming” had finally arrived to the Hollywood Palladium on November 30th, 2010. It did not disappoint. There was a vibe of anticipation felt on Sunset Blvd early that evening. Doors opened at 7pm and you could tell that the people there were very excited. Even while waiting in lines to purchase 12oz domestic beers for 7 bucks, fans were smiling and chatting with one another about how after several years, we were all finally going to witness a full Faith No More set. The Creepy Creeps played first and I’m sure on any other night the crowd would have enjoyed their ghoulish punk rock set, but not on this night. Everyone was there for one thing and one thing only. 10:15pm. The lights went dim. All the camera phones in the audience were raised. The four musicians on stage had the full attention of everyone in the building when we heard the first few notes of the song they had opened with the entire tour. Everyone knew they would open with their own version of “Reunited” which is essentially a duet featuring both Mike Patton and keyboard player Roddy Bottom. It was time for “The Second Coming”. I drove back to Hollywood on a solo mission to see them play the very next night. I had to. 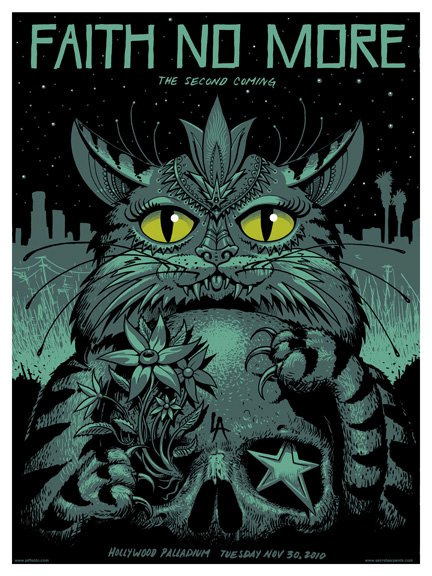 There’s a chance we may never get see this band play live again… after the two Hollywood shows they were scheduled to travel to Santiago, Chile to wrap up the tour. I’m very thankful. Being there for two consecutive Faith No More shows in Hollywood was one of the most amazing and memorable concert experiences of my life. Next Next post: ad: Pinata Protest TOURS!